There is a heightened awareness of the importance of recycling and caring for our surroundings in today’s society, which is why, when the Framlab studio in New York came up with the idea of capitalising on unused spaces to create temporary housing for homeless people, everyone loved it. Given the large number of homeless people in the city, the architects at the Framlab studio devised a project called Homed which makes the most of urban spaces which are, on the whole, vacant for the construction of small capsules for housing. This consists of a single bedroom and everything a potential resident would need for a definitive period of time in order to make life easier for them. A total of 61,000 people sleep in the city’s homeless shelters every night, while thousands more sleep rough on the streets or in public transport areas such as the subway. The statistics, and these only reflect the problem in one city, are truly shocking. This project is a challenge that promotes the construction of temporary, low-cost housing spaces. The architectural studio looks to utilise city space that is currently unoccupied, the aim being to build a scaffolding installation on a variety of different structures that facilitate the creation of vertical lots to hold temporary accommodation units. The final structural group is reminiscent of a honeycomb. 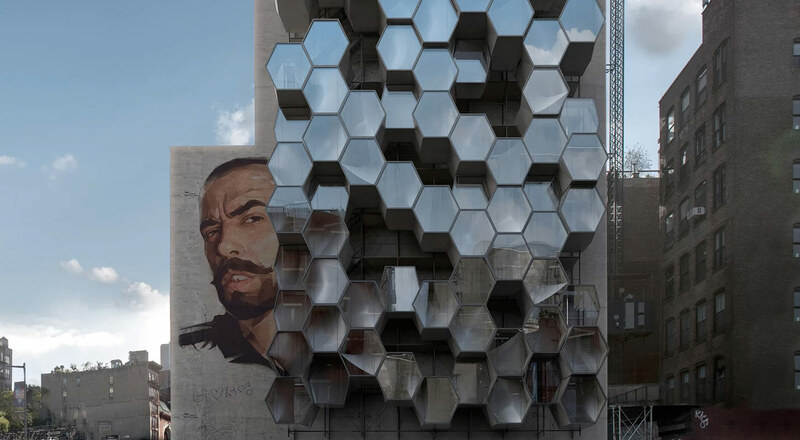 The capsules are constructed from steel with an outer sheet of oxidized aluminium, while 3D-printed plastic is used for the interior to generate multiple options, adapting the module to the specific needs of the resident. Some elements of the fittings and furniture, also 3D-printed, are made from biodegradable, vegetable polymers bioplastics.